I felt apprehensive heading out to Tiger Beach where I was supposed to enter open water in the presence of some big, wild apex predators, without any protection other than holding up my camera as a shield in case I was singled out as a snack. 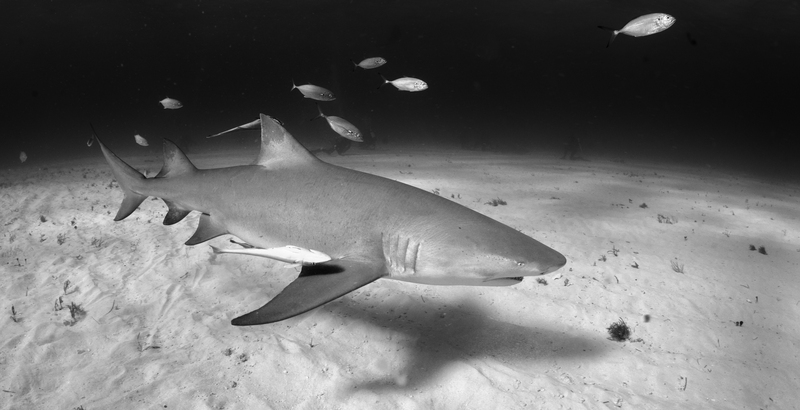 Before the week was up, I could not get back in the water fast enough, moving around with growing confidence amongst several of these huge but most graceful sharks and having encounters and interactions that left a deep and indelible impression, which will stay with me for the rest of my days. The trip started off on a somewhat chaotic note. The marina in West Palm Beach, our point of embarkation, was temporarily undergoing construction making the vessel, Dolphin Dream, difficult to locate. A couple of the other guests did not show up before our skipper, Scott, finally conceded defeat, after waiting all evening, and proceeded to set a course for the Bahamas. As we were also in for a rather windy and bumpy ride across the Straits for Florida, I felt as if all the bad omens were piling up and that I would surely come home missing a limb or two. A week later when I had the benefit of hindsight, all those sentiments, probably fuelled by all the compounded stresses and worries from my everyday job piling up, all seemed quite laughable, but at that juncture, being thrashed around in my cabin, I did question the sanity of what I had now committed myself to. After clearing Bahamian customs in West End at some desolate pier with nothing in sight, we went for a short test dive on the reef along the nearby coast. There were no sharks, but having listened to briefings about constantly keeping an eye out for sharks sneaking up behind made me somewhat watchful for what may suddenly appear out of the shadows, yet nothing did—no big monsters with sharp teeth, at any rate. The next morning I woke up to find the boat being berthed on Bahamas banks in what at first glance seemed like the middle of nowhere. I could not see any land. What I could see, aft of the stern, was a dozen shark fins cleaving the still choppy surface and the outlines of agitated shark bodies jetting here and there—lemon sharks, I was told. Still pensively clasping my morning coffee, the realization sunk in that I was supposed to soon jump into the middle of that bar fight. Hmmm. The clutter of shark fins looked like the opening of a cheap horror movie from the 1980s. Nevertheless I kitted up, reminding myself that tour operators would probably not have been able to build up and sustain a stable operation for decades if their customers came home some limbs short. Murmuring “Morituri te salutant” (the Ancient Roman gladiators’ traditional greeting: “Those who are about to die, greet you”). I took a giant stride and made my way through the shark tussle to the sandy bottom under the boat. The lemon sharks seemed to largely ignore my presence and just kept on doing their business of swimming around. I could not get my head around what attracted them to the boat, because while there were a few bait boxes out dangling after the boat, I don’t think there was anything in them at that juncture. The sharks did not come across as one bit interested in us bipeds either. It was more like they congregated just to hang out among themselves, although that is pure speculation on my part—however, that was my impression, in this instance. The lemons are quite graceful, having a very smooth and hydrodynamic body. They don’t really interact much, they do not seek out contact, and they don’t seem to look much at you as they just slide by looking for… whatever. At any given time, there were probably around 30 lemon sharks swimming leisurely about in smaller groups as if they had all the time in the world. Perhaps it was exactly what they had. It was not the last time I would wonder what went on in the head of a shark that week. A smaller number of reef sharks were seen patrolling leisurely at the perimeter as if they preferred to keep the shuffle right under the boat at fin’s length. The reef shark stands out as the archetypal shark, like an ignorant cartoonist would likely draw them with their sleek and perfectly shaped bodies. They too seemed rather oblivious to our presence, except they did not fancy being approached too closely but keep their distance. Yet they also seemed keen to keep an eye on what was going on with all this commotion. It was not until after the first dives, during a coffee break, that we got word that a tiger shark had now shown up at the scene. That got everyone’s attention. During the initial briefing Captain Scott went over some safety rules and recommended practices while diving with tiger sharks—first and foremost, to stay in front of them and keep eye contact. It was also impressed upon us to always watch our six and check if there were any sharks behind us. 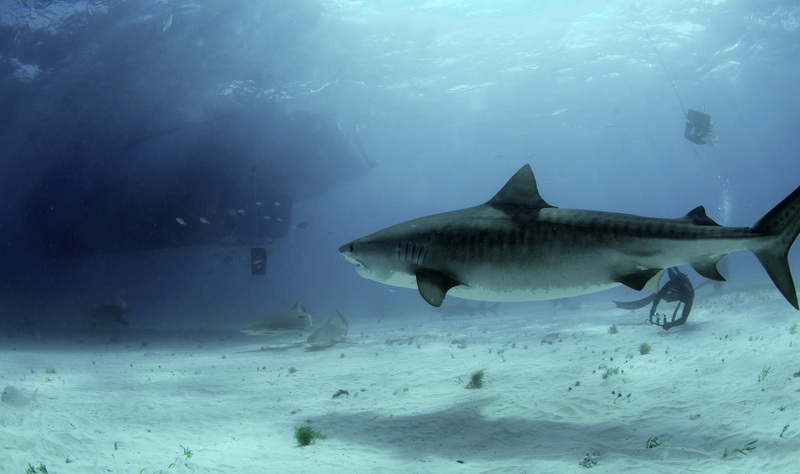 Apparently tiger sharks have a mischievous streak and like to sneak up behind inattentive divers. And we wouldn’t like to be nibbled, would we? Back in the water, I could not immediately see any tiger shark. Apparently, it was seen over at the next sandy patch behind a fringe of reef. Making my way over there pushing my big camera rig against a bit of current, I kept down low, going over the reef, so I could get my back up against a boulder or coral head if necessary… as if that would make much of a difference. And then I caught my first glimpse of it. Majestically, she appeared out of the din, slowly passing by at some distance, as if she was vetting us. Later, I came to understand how some of these individuals have been traumatized encountering other and less appreciative specimens of homo sapiens who left them scarred by hooks and disfigured by bang-sticks. At that juncture, however, I was still not quite rid of the notion I had that one of these rather huge apex predators could label me as lunch. 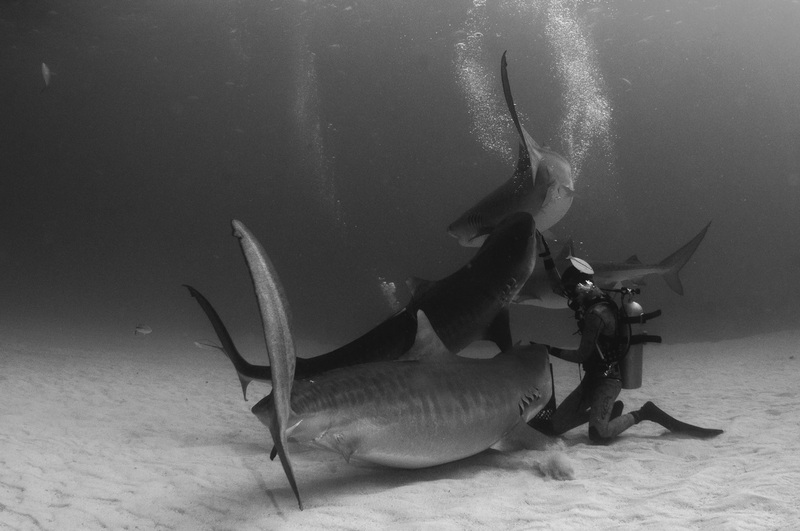 It turned out our first tiger sharks were both old acquaintances. Well, not of me, personally, but they were the very same individuals that had been featured in some other tiger shark features in our magazine in past years. I did not know this fact at the time, though. As far as I was still concerned I was now out in open water face-to-face with a big wild animal, with nothing between us except perhaps my camera rig. I could not hide; I could not retreat. However at that point, I no longer wanted to. Instead I found myself mesmerized by this other creature, which had materialized right out of the blue. It swam by quite slowly appearing not to size me up but more to seek out eye contact as if to assess out what kind of biped I was. I could of course, like so many before me, just have fallen foul of anthropomorphism—attributing human characteristics or behaviors to animals—but the tiger sharks do instill a sensation of contact and communication from the onset. Whether it is indeed the case, who can really say? Looks can be deceptive, and it is easy to jump to conclusions. But in so many other contexts, we have learned to interact and to some degree communicate with animals. Any pet owner will testify to that. Once we get to know animals, we can read their body language and their state of mind. In so many other cases, we can tell whether an animal is relaxed and pleased or upset and a possible a threat. And while a tiger shark is surely neither a purring kitten or a snarling dog, sharks too have body language that gives away their state of mind. It is obviously quite possible, to some extent anyway, to read them. The question is more about how much we could and should read into them. Where is the point where we are just making unfounded inferences, and possibly making a mistake? When chimpanzees, the species closest to our own, seem to grin, it is not because they are amused, it is a sign of fear. The tigers were, however, never agitated or excited in our presence but moved about calmly and gracefully. At first, they cautiously kept a bit of distance as if they needed to get a feel for this particular bunch of bubbling bipeds before moving in any closer, but after a while, they gradually seemed to overcome their initial apprehension and moved in closer while eyeballing each one of us, big time. Why did they find us so interesting? Were they just hoping for a snack being handed out by somebody? That couldn’t be it. For one, they were not one bit pushy just… inquisitive, it seemed. Maybe we were just providing them with some entertainment. The tiger sharks have these big and expressive green eyes, which leave a strong, lasting impression of a sentient and pensive intelligent being. During the following days my confidence and appreciation of the many encounters only grew. I was never complacent or over-confident as we were repeatedly cautioned that these sharks also have a mischievous streak and like to sneak up on inattentive divers from behind. But I arrived at a point where I felt comfortable and at ease among these big fish, which in return gradually also permitted me to come still closer. Had anyone, prior to my trip, told me that I would some day find myself in open water facing a couple of big wild tiger sharks and not only remain unfazed but also touch them, I would probably have looked back at the perpetrator with utter disbelief. Yet, that was exactly was I was now doing, and I was having a blast too. As one of the tigers swam leisurely close by me, I was gently stroked by her body sliding by. Her skin felt like smooth leather on top of toned muscles. I have frequently been mulling over their behavior ever since. They are free roaming wild apex predators, yet they chose to interact with humans in so many ways including allowing our dive guides—who were amazing—to handle them physically, rolling them over and stroking them. Both their initial cautious approach and their curiosity are telltale signs of an analytic capacity. In nature, injuries that are not necessarily fatal in themselves may render an animal vulnerable to attack or unable to feed and must be avoided at all costs. Yet curiosity and the ability to learn from experience is also a trait that improves the chance of survival, and the sharks seem to be balancing these opposing urges all the time. Back on the boat, we had long since settled into the usual routine: dive, look at photos, dive, eat and look at photos, dive, eat… etc. The vessel is a converted shrimp trawler, and at first sight, I wasn’t overly wowed, I must admit, but as it turned out, she was both a very stable and comfortable ship and the interiors were well laid out, with a spacious salon. The cabins below deck were on the smallish side, not very fancy and clearly just a space to retreat for some shut-eye. However, I did not find it mattered one bit, as one would spend time in the salon going over and working on images or just chatting with other passengers, perhaps even forging a couple of new friendships. In the salon there was a drink bar with a refrigerator full of soft drinks and juices, coffee maker and lots of snacks, cookies and fresh fruit. Being an espresso junkie and overall coffee-snob, I did not take fancy to the standard brew, but I was pleased by the selection of quality teas, which were actually quite excellent for a refreshment between dives, along with a biscuit or two. On a related note, I can also report that the home-cooked meals on board were both delicious, varied and healthy and made from fresh produce. Good food is simply a requirement on a liveaboard and the cooking aboard Dolphin Dream was no exception to this golden rule. I noted small but important details (to me anyway): there was quality Greek yogurt, fresh berries and muesli available for breakfast and the vegetables at dinner were really good. I could not help having a little chat with the cook about her food shopping principles and was pleased to learn how picky she was in selecting the right stuff and cooking meals that were also healthy and varied. There was always good meats and various seafood as well as yummy snacks. Did I mention the raspberry smoothies in between dives? One early evening as I was sitting in the salon quietly relishing the goodness of life sipping a cup of hot tea after an already long day packed with several great dives, some commotion was suddenly heard from the deck outside. A pod of dolphins had been spotted and Captain Scott came out of the wheelhouse to ask the esteemed assembly if we would care for an extra treat. Ask a silly question. Faster than a six-year-old could nod yes to an ice cream, we were all up for a sunset swim with the dolphins. In no time, as the captain revved up the boat and sped off to get ahead of the travelling pod, we slipped once more into our wetsuits, closed our camera housings and congregated on the dive deck, focused and poised to enter the water on cue. Like paratroopers we peeled off the boat in rapid succession and found ourselves bobbing around in the open ocean as the sun started to hang low on horizon. We were over a completely featureless white sandy bottom some 10-12 meters below. The visibility was generous with no discernible particles in the water, which in combination with the soft and light, created an almost cathedral-like ambiance without shadows. Then the dolphins appeared on stage, moving at great speed. There were some 20 to 30 dolphins in the pod, their exact number difficult to estimate as they were going all over the place, breaking up into smaller groups, in pairs, in fives, joining and splitting up again, darting in and out of visible range before coming racing back. Judging from the considerable variation of coloration and patterns on their skins, they were obviously Atlantic spotted dolphins. Some were uniformly gray, others dark or highly spotted. It struck me how the encounter with these gregarious mammals stood out in contrast to that of the sharks. Where the sharks were apprehensive and swam about almost sedately, the dolphins were all over the place from the onset, energetically performing all sorts of high speed maneuvers as of they were showing off. Like the sharks they were also interacting, though not pausing to take a closer look, but observing us in the passing. It was impressive but also a less intimate experience. Whether it was also down to the lack of a latent fear factor or just another case of comparing apples to oranges, I cannot quite say. The two experiences were both very aesthetic, but where the tigers sharks had a more majestic presence, it was the agile elegance and energy that defined the dolphins. Also in the presence of sharks, it was all about moving with deliberation, mostly sitting on the sand while regularly checking your six, but with dolphins around, we were swimming freely without scuba gear, struggling just to turn around fast enough to keep them in focus. We made it back onto the boat just as the sun set over a perfectly flat ocean in an intense display of orange and purple hues. As a perfect day was coming to an end, tranquility settled inside me as I pensively watched the spectacle, clasping yet another mug of hot tea. My journey was about to come to end in more than one sense. We, guests on the boat, had not only now spent our five days on the Bahamas bank but also undergone a transformation in our understanding and appreciation of some of the most majestic and enigmatic wildlife on our planet. The world would surely be a better place and in healthier state if politicians and captains of industry could have these insights, but that’s just wishful thinking. The diving is technically quite easy, with depths mostly in the range of only 10-12m (33-40ft). Decompression limits and decompression illness (DCI) is hardly a concern, and one can enjoy a leisurely, lengthy dive, mostly dictated by meal times. These trips are clearly mostly for wildlife connoisseurs with or without cameras and/or scuba kit. Peter Symes was invited by Dom’s Dive Advice and Dolphin Dream.